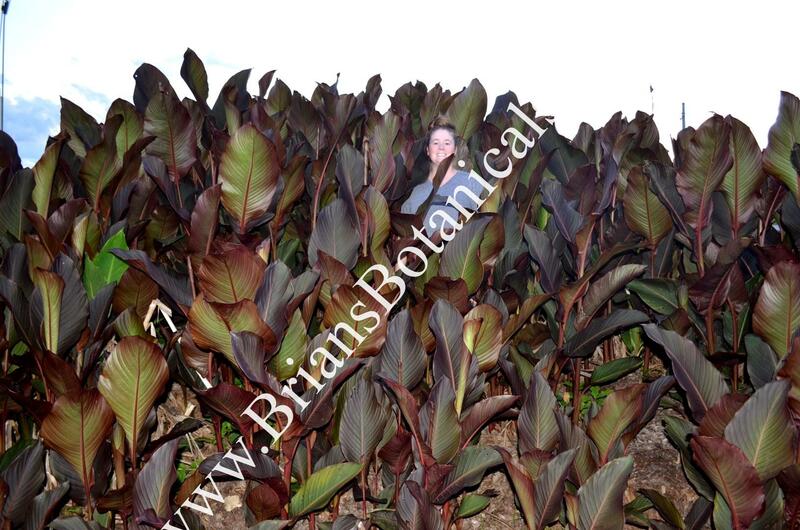 Canna Daddy’s Buckaroo this dark leaf giant canna is a hybrid I made around 5 years ago. During that time I had been using a lot of Canna Musafolia and Canna Russian Red as parent plants. This is one of the results of some of that breeding. A giant dark leaf canna wich emerges dark maroon and grows up to around 8 to 9 feet tall producing pink to orange flowers. The foliage seems to lighten up with age. The leaves are large usually 2 feet long or more and 1 foot wide or more. This canna has proved to be one of the hardier varieties I have breed and produces large rhizomes that are very bulky and large. Plants are shipped barerooted.